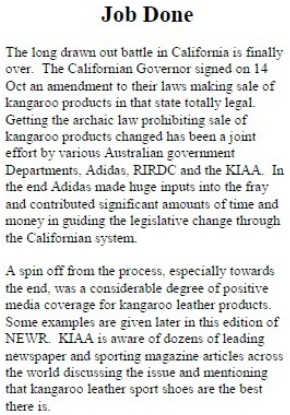 California’s legislative ban on the importation of kangaroo products was due to resume its effect at the end of 2015. However the commercial kangaroo industry was confident it would convince legislators to permanently lift the ban and allow unimpeded and unchecked importation of kangaroo skins and meat. On 11 September, the last day for debate on urgent bills, the industry’s bill to permanently lift the ban failed to pass the Californian Senate, allowing the ban to be reinstated from 1 January 2016. There is increasing concern about the science that is being cited to justify the continuation of the commercial kangaroo shooting and export industries. In 1971 California banned the importation of kangaroo products. 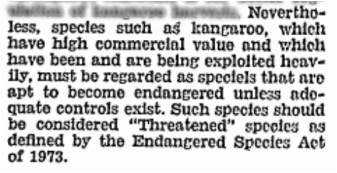 The (then) three commercially shot kangaroo species were listed as threatened on the US Endangered Species Act in 1974. The US Fish and Wildlife Service banned the importation of those species in the same year after the Australian Government itself banned the export of kangaroo products in 1973 following evidence of serious decline in kangaroos. Australian kangaroo exporters and government worked for three decades to convince the United States government that commercially shot kangaroos were abundant and management practises sustainable. The US federal ban was lifted in 1995 and trade resumed while the Californian and New York bans were ignored, until animal welfare organisation, VIVA! International Voice for Animals, attempted to enforce the ban on the sale of kangaroo products. Kangaroo Industry Association of Australia. " Job Done". Newsletter Number 49, Nov 2007. Adidas, who lobbied Californian Senator Ron Calderon to sponsor the 2007 legislation lifting the Californian ban, then became one of his donors. In 2013 Calderon was investigated for corruption, with his trial beginning August 2015. The commercial kangaroo industry ignored the July 2015 deadline to introduce its bill to permanently lift the ban, and sought to “gut and amend” an existing Californian bill that had passed all the necessary legislative processes. In the gut and amend "maneuver" a legislator, at the last possible moment before the end of the legislative year, guts the original content of their bill that has passed all necessary transparent legislative reviews and public scrutiny. Its contents are then replaced with a completely different bill that is procedurally treated as having passed the same legislative scrutiny as the original bill. Gut and amends are disallowed by Californian legislative rules, which can be waived by the Rules Committee. The procedure is widely condemned as "violat[ing] almost every legislative rule" of "normal and open legislative process", and used to "circumvent the rules to enact failed pet projects and special favors". With Senate deadlines for debate looming on 11 September, a ‘gut and amend’ was supposed to disguise the bill’s introduction; remove time to examine increasing concerns about the commercial industry; and force truncated debate on the issue. Because 'gut and amends' sidestep due and proper legislative processes, they require special permission from the Californian Senate. With no Senator willing to sponsor the bill, freshman Assemblyman Mike Gipson agreed to sponsor the bill. He inserted it into his gutted existing bill that originally dealt with gambling regulation when he had introduced it earlier in the year, and tabled it as an urgent bill in the last week of the year for debating bills. This was widely condemned as a subversion of due process, moreso given the serious questions about the status of kangaroos and the kangaroo industry. It was reported that Assemblyman Gipson and 13 other Californian lawmakers had received $1,000 payment from the KIAA/Australian Government's lobbyists. In the last hours of the Senate deadline of 11 September, Californian Senators chose to not allow a vote on the contentious bill. The current Sunset Clause allowing imports expired at the end of 2015. The Californian ban on the importation of products made from shot kangaroos came back into effect on 1 January 2016. Kangaroo Industry Association of Australia. Job Done. Newsletter Number 49, Nov 2007.